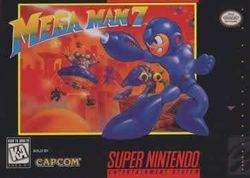 Mega Man 7 was originally released in Japan as Rockman 7: Fated Confrontation! (ロックマン7 宿命の対決!, Rockman 7 shukumei no taiketsu!?). It's the 7th game in the Mega Man series, which originally appeared on the SNES and then later was bundled within Mega Man Anniversary Collection for the GameCube, PS2, and Xbox. In 2014 it was made available for the Wii U Virtual Console via the Nintendo eShop.